When politicians use the word 'sustainability', it usually triggers red warning lights in my head, rather than flagging the presence of green policies. Political discussion of sustainability encourages misdirection and mirror play. The result departs as far as possible from true environmental policy. One of Julia Gillard's first moves as Prime Minister was to change Tony Burke's title from Minister for Population to Minister for Sustainable Population. It might seem to be an innocuous shift. After all, what's wrong with asking for a sustainable population? What's wrong with that mystic number that, as Gillard told Fairfax, 'our environment, our water, our soil, our roads and freeways, our busses, our trains and our services can sustain'? Burke told ABC Radio National on Monday that his new job description 'puts a high priority on us making sure we can develop forms of measurement as to what's the environmental footprint, and to look at some of these environmental questions as well as transport, infrastructure questions, probably with a higher degree of focus'. Cue the blinking of a thousand tiny red lights. The shift towards a political discourse of 'sustainable' population growth allows parties on both the left and the right to associate a growing environmental consciousness with fears over immigration. Recently, internal Labor Party polling has shown that in Western Sydney, where the Labor Party's primary vote has dropped to 30 per cent, people's main political concern is the government's policy on asylum seekers. The number '40 million', which seems to suggest we're about to invite the entire population of Canada to come hang out with us next week, is in fact an exaggerated treasury estimate of Australia's population in 2050 based on current trends. But even apart from that, it's hard not to see this new discourse in a cynical light. Of course, I might have wished that public transport hadn't been privatised and subsequently ruined by business interests. I might have wished that something would be done about the constant cancellations, breakdowns, and lateness. I might have wished that even a fraction of the taxpayer dollars spent on roads was spent on alternative forms of transport. I might have wished that we spent more time looking for viable, non-polluting energy sources, and less time waiting anxiously for polluting industries to clean themselves up. But no, what I thought was: I really wish our population growth was more sustainable, and that someone would stop letting refugees flee their war-torn countries for ours, where they cause trains to be cancelled on a daily basis, and make us all very crowded. There are sensible elements in the change to the portfolio, especially in the potential to disaggregate the issues involved and include regional areas in the analysis of the population. But we must remember that despite being a comparatively very small nation (roughly 0.3 per cent of the global population), Australia has one of the highest per capita greenhouse gas emission rates in the world and regularly tops global emitter lists. Despite the evidence, we have yet to grasp that the larger problem is not how many people we have, but how they use resources. We know very well what we have to do if we are to be sustainable. It has nothing to do with turning back asylum seekers, and everything to do with examining our environmental behaviour. The question politicians should be seeking to solve is not 'How will immigrants and refugees hurt our environment and crowd our buses?' but 'How come we're already hurting our environment, and why aren't there more buses?' And the government should not be looking for a level of population that our environment can support. It should ask how our population can support the environment. Ruby J. Murray is a writer and researcher recently returned to Melbourne from Jakarta, Indonesia, where she worked in media and communications. She is co-founder of The Democracy Project. Ruby's blog. Thanks ruby. How much racism, how much cynicism, how much meanness can australia sustain? I agree with the content of this article and particularly the slant on political speak and the euphemistic use of the term sustainability. We must call a spade a spade, but let us also also not lose sight that our planet for the first time in its 4.6 billion years is now showing the effects of overpopulation, which does present problems of its own. If we stopped abortion and contraception by which we offend God grievously every day,and supported family growth and career orientated education, we would have no need of "skilled" immigrants or the current too-high levels of immigration. Let Australia grow naturally and trust in God. Ruby Murray has a point. We tend to blame others for our inability to cope with our problems. Migrants - aren't we all? from the first 'settlers' onwards? - have enriched this country. Who were the first white settlers if they were not migrants from oppressed origins? Also, living in Jakarta has made Ruby Murray understand that somehow, notwithstanding the density, humankind does have the capacity to cope. In the case of Australia, I think, better than most countries if we try harder and stop blaming migrants for our ills. The question is will we invest our intelligence to make it more 'sustainable'? A: We'd have fewer refugees from war-torn countries arriving if we would stop helping the Americans war-tear their countries, e.g., Vietnam, Iraq, Afghanistan. I understand why the new PM doesn't commit to say the number. It's politically unwise as her predecessor has paid the price for saying so recently. But I believe Australia needs a larger population to sustain itself in different things: sustainable economy not to heavily on exports, sustainable defense with sustainable military personals, and a few others that need larger population. This is condition 1. Obviously, Australia doesn't have enough water and maybe other resources for that. This is condition 2. Then, how can we reconcile the two conditions? I believe Australia must increase the population of the Aboriginal Natives. They will obviously love this country and will defend it more than any migrants. They can live in (deserts) their ways with some of their traditional knowledge - with modern standard of lifestyle. They must have their time in the future. By increasing population, Australia must not clear its green. The growth of big cities cannot be sustained. Ms Murray confuses two groups of people, genuine refugees and (skilled) migrants. There should always be room for refugees at that's Australia's international obligation but that's only a very small fraction of the immigrants' intake. Unfortunately, most migrants are not poor boat people but come by plane on a visa. Most immigrants are from Britain, China, and India, people who would have had plenty of opportunity in their own country. They just come for an even better lifestyle. It is really not necessary to add more (skilled) migrants from countries that are not war torn. It is right that Australians should accept their responsibility for harm done to the environment. Also, as we now believe that we live in a global village, we ought be looking at ways to share what we have with those who have so much less of the world's resources wherever they live. There is no correlation between high population density and environmental harm. If we take Japan for example, it has one of the highest population densities in the world, but has also more areas of land as forests than other nations. Some of the worst environmental land degradation in Australia actually occurs in remote rural areas, where water and land degradation are a disgrace to our nation. In Queensland alone the destruction of the Brigalow belt has been an environmental vandalism act hardly surpassed anywhere in the world. The challenge in Australia is not having a big population, but a Government, which is going seriously to address environmental problems. We see a lot media stunts showcasing environmental achievements, but we see continuos destruction of our land and water resources. Australia can sustain at least twice the current population, but it has to give far greater attention to sustainable management of natural resources. I wish scaremongers like Murray would get out on the ground in our wide brown land, also note the thousands of square kilometres of empty oceans surrounding us and breathe the purest air on this planet; then realise that even major cities like Sydney and Melbourne are really minuscule in the scheme of things. Tokyo railway line handles about 1,500,000 people, vic is 380,000 per day... immigrants are a problem? if tokyo can handle 4 times our customer base and have efficiency levels higher than ours, the problem isn't in the population. You're right. It's all immigrants, because Australians never use resources that cause green house emissions. And by Australians I mean actual Australians, not the generations of white immigrant descendants that populate the cities causing pollution. Thank you Ruby for your article we need to think about. However I have lived in forty countries and hardly any can compare with spacious Australia. Look how the post war 11 immigrants to the present day have made our nation one of the best in the world. I am proud of our nation and the way it accepts deprived people from other nations. Yep Gillard brought out Howard's great big dog whistle and blew it for the world to hear. Peter read it again, it is not Ruby scaremongering, it is Gillard and co. So if we wish to whitewash a policy we just add the word 'sustainable'. It is another way of focusing our attention away from the real issues of tackling climate change, developing alternative energy, taking on the coal lobby etc. Just keep the electorate focused on the scaremongering of the Howard years and wrap it in a new package. As someone who lives in Melbourne and takes the peak hour train home at least once a week, I too have had those thoughts about migrants being a possible reason to blame for the overcrowding of Melbourne's (and Sydney's trains). But then I realised that the city of Perth has been growing at a rapid rate over the last 20 years and they've managed to build proper infrastructure for their growing city. Its the state governments of NSW and VIC that are to blame for our infrastructure problems, not the migrants. As for our migrant intake, we do take far too many skilled migrants in at the detriment of refugees and that is a federal issue. At the end of the day it comes down back governance all round and only we the people are responsible for that. We are the ones who keep being apathetic and voting these people time and time again knowing full well how they behave. B--s Ruby, you are out of Australia. 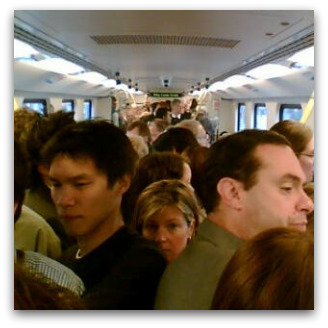 Come home and write about the problems of overcrowded Australian cities! PLEASE! "The last time that I got on a crowded train......" -- written from Indonesia? Well, I'm writing from Brussels but I wouldn't have the cheek to interpolate such a sentence in a piece of opinion. And P.S. I really wish that all respondents were REQUIRED to fully identify themselveds. In Prime Minister Gillard's latest public statement on migration, she emphasised that Australians want 'the right kind of migrants' and cited her parents as fitting that bill. This sounds awfully similar to John Howard's 'we will decide who comes...'. As a non-white immigrant, originally from a third world country, who has worked as a volunteer with recently-arrived refugees, I found this statement immensely offensive. This, like the emphasis Ms Gillard places on 'hard-working Australians' sounds like the abhorrent dog-whistle politics that ill-befits a former Minister for Social inclusion. I do not doubt the PM's competence and I welcome her historic achievement; I just hope these kinds of remarks do not indicate a descent into the kind of scapegoating of the most vulnerable people in our society that we have seen in the past. A quick note regarding comments about Ruby Murray's geographical location: Ruby has recently returned to Melbourne from Indonesia, but the Editors failed to update her bio prior to publication. The bio has now been updated. Apologies to Ruby and for any confusion caused. "Sustainable" is a weasel word. perhaps Ruby and other Journo's will take up the definition with the PM. I feel that the media has, once again, let us down by not taking up the definition of the word with the Minister or the PM. Its clearly another bit of unsustainable SPIN. I think I can say, without contradiction, that her definition will be quite unlike what ordinary mortals have in mind. My guess is that it has a lot to do with maximising mining revenues, or sustainig a labour government for as long as possible. Christians rarely agree on what they want from government. The Australian Christian Lobby jumped the gun last week with its forum for political leaders to address Christian voters: the elevation of Julia Gillard means it now needs to engage afresh with a new Prime Minister.